Opis: The Sun rotates on its axis about once every 27 days. How can you tell? Just follow the sunspots. This composite picture was constructed from solar images recorded daily by the MDI instrument on board the space-based SOlar and Heliospheric Observatory (SOHO). 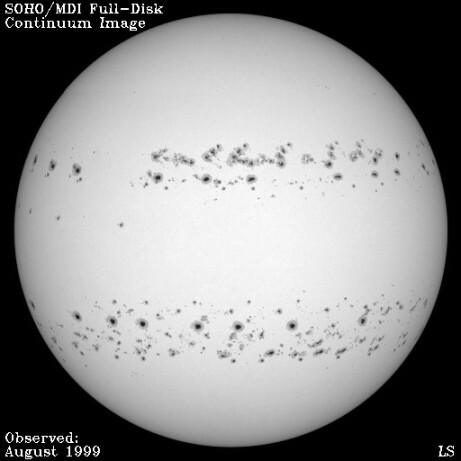 It shows the Sun's visible surface for most days of August 1999 so that the same sunspots appear many times as the solar rotation carries them across the face of the Sun. Sunspot temperatures are around 5,000 degrees C. but the spots appear dark as they are actually cooler than the surrounding regions of the solar surface. The sequential images of the sunspot groups show how these regions with high magnetic fields change from day to day.